The word ‘Disney’ conjures a variety of images, from theme parks and attractions to feature films and television shows, and there are so many wonderful stories about each and every portion that makes up the ideal of Disney. Behind the gleam of the finished products, however, is a vast horde of dreamers and doers who made the incredible look easy. For those that worked tirelessly crafting Walt Disney World, the trick to finding the stories of their successful dreams, one simply has to take a glimpse at any window on Main Street U.S.A. To really obtain a dream takes more than wishful thinking, it takes determination, focus, time and copious amounts of hard work. What you are reading today is the hard work portion of my own dream. Dreams have a funny way of shifting on a person, at one point in my life I dared to believe that finding the perfect partner in life would be my dream come true. To be clear, it was, but after marrying Aileen I found that other dreams sprung up from within me. My current dream is to one day write for The Disney Company. 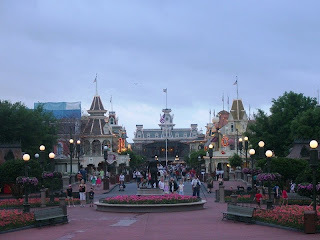 Whether in the form of press releases, attraction story development or books on the history of the parks, I’m not too particular, just that I am able to use the talent I have for words to deepen the knowledge base of Walt Disney World. I also know I could be happy never working for Disney directly, but crafting books and articles from outside boundaries of the Vacation Kingdom. The model for this has been set out by my good friend, Lou Mongello, and is a path I hope to one day emulate with some reasonable level of success. It is wonderful to have dreams, to dare to reach beyond what is safe and available, but that doesn’t mean that it will, or should, all be a perfect path to the Emerald City. In fact, it is my belief that the bumps along the way are what define the dreams and make them that much more exciting when they are reached. Walt Disney called this ‘a swift kick in the teeth,’ and offered that it was a good experience for the young, and I couldn’t agree more. I didn’t discuss this with many at the time, only a select few whose input and encouragement I needed, but last fall I applied for the vacant Social Media Manager position at Walt Disney World. I felt my combination of writing prowess, awareness off current Walt Disney World policies and practices and overarching familiarity of the current social media pool made me an ideal candidate. As it would turn out thousands of other applicants with varying degrees of experiences and expertise, some similar and some radically different from my own, felt the same way I did. At this point, it should be obvious that I did not get the position. In fact, I didn’t even make the cut for interviews earlier this year. Couple this disheartening turn of events with some other extremely trying circumstances I’ve been dealing with recently, and it is enough to make anyone start to question their dreams. But I am not here to tell you I have decided to close up shop on the Main Street Gazette, quite the contrary. I am here to let each and every one of you know that I am going to redouble my heart and mind into making the Gazette a beacon for those seeking to add a splash of Walt Disney World to their day. Earlier, we said that the windows of Main Street U.S.A. held within them wonderful stories of successful dreams, and most likely each and every person there could tell a tale about bumps in the road. Nevertheless, it is not a photograph of any of these windows that I have hanging on my wall as a reminder. It is a few words from Randy Pausch. In brief, Randy Pausch gave a talk known as “The Last Lecture” on the campus of Carnegie Mellon University in September of 2007. The address was titled, Really Achieving Your Childhood Dream, and was delivered almost a year to the day that Pausch was diagnosed with pancreatic cancer and only a month after he was told that he only had a few good months of health left. This one lecture led to a book, a meeting with Oprah, and even a small role in the recent Star Trek reboot film. Pausch passed away in July of 2008. Really Achieving Your Childhood Dreams does what I cannot do for you here, it takes you through the journey of going from dreamer to achiever and how life interrupts the best laid plans, and it does it with insight, wit, and more humor than one should have facing terminal cancer. What was the childhood dream of Randy Pausch? To create the world of Disney, to become an Imagineer. A feat he finally reached, taking a road he probably hadn’t even considered in his formative years. Randy Pausch’s story has moved many and inspires any who take the time to invest in listening to his speech or read the words he has written (which I recommend you do immediately if you have never taken the time). A small winding plaque, mimicking the wild leaves of Alice in Wonderland, sits before the Mad Tea Party topiary in the Magic Kingdom. The words of Randy Pausch inscribed there are as follows, “Be good at something; it makes you valuable… have something to bring to the table, because that will make you more welcome.” Those are the words I strain to live by these days, and have for the past several years. I have no doubts that I am good at something, although anyone with enough resolve could be just as good or better. Nor do I have any preconceived notions that the teeth kicking incidents are over. But that doesn’t mean I am ever going to stop pursuing my own dreams. It only means that, for now, the Main Street Gazette is what I bring to the table and I hope you enjoy it. The real question is, what are your dreams and what do you bring to the table? Dang Ryan, my eyes leaked! You are a great friend, and I wish you all the best as you keep doing what you do. Remember, there were more than a few years from when Walt first thought about a place where parents and children could have fun together, and the opening day of Disneyland. You'll get to your opening day. I have no doubt of that! I have a special place in my heart for Randy Pausch, thanks for writing this! And remember, "The brick walls are there for a reason. They're not there to keep us out. The brick walls are there to give us a chance to show how badly we want something." I have no doubt you will some day achieve this dream Ryan! I love reading your site! I hope that you get to live your dream! I want to move to Florida, and I too want to work for Disney. Maybe one day I'll make this a reality! I really started to tear up when I read your comments! Good luck. Remember what Walt said, "All your dreams can come true if you have the courage to pursue them." Thanks so much for doing what you do. I hope all your dreams come true. Thank you for sharing yourself. It really made an impression on me tonight. I look forward to reading your thoughts for many years to come. Another of Randy's quotes: Walls aren't put up to keep people out. They are there to see how badly you want in. Few people get to be a cast member on the first attempt. Randy Pausch tried many times, if you recall. I hope you make it one day and it's all that you dream it will be. I read Main Street Gazette more often (everyday) than the official Disney blog! I think that says all you need to know about the great job you do Ryan.